As she rolled on by (she never actually made a complete stop), I had to smile. Not only did she enjoy the recipe, she gave me a brilliant new use for it. To be specific, she tosses the vegetables in the vinaigrette before roasting, instead of olive oil. The story on this salad is that I ordered something similar at a restaurant a couple of years ago. I enjoyed the combination so much that I set out to recreate it. While a salad alone is easy enough to replicate, the dressing can be a bit trickier. Yet it is the dressing that has the potential to make a simple salad truly outstanding. One evening, I stood in my kitchen, tinkering with the amount of Dijon, vinegar, and maple syrup until I achieved what I considered to be the perfect balance. Luckily, I kept a record of every alteration, because I have been making this salad (and roasting vegetables with the dressing) regularly ever since. For the Spiced Pecans I like to add to this salad, click here. For a well-rounded meal, this salad pairs perfectly with Wicked Good Chicken and Maple-Dijon Roasted Root Vegetables. 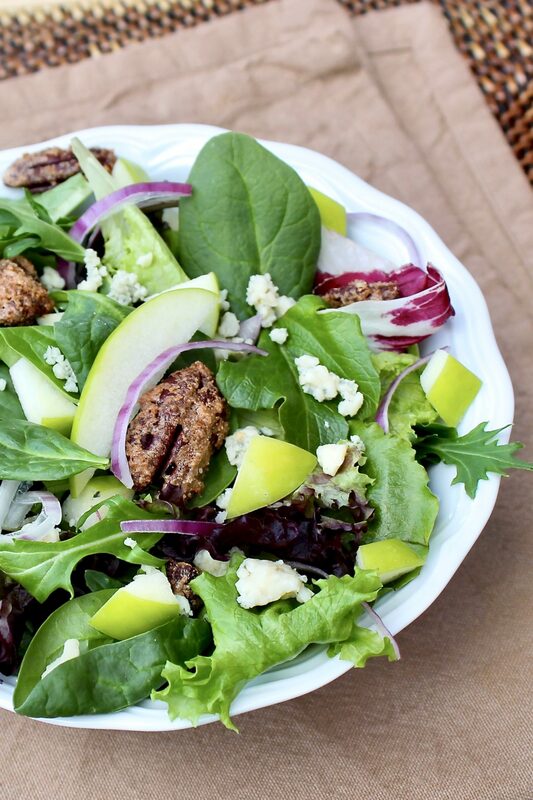 While plain pecans work well in this salad, spiced pecans, whether homemade or store-bought, add extra flavor and texture. 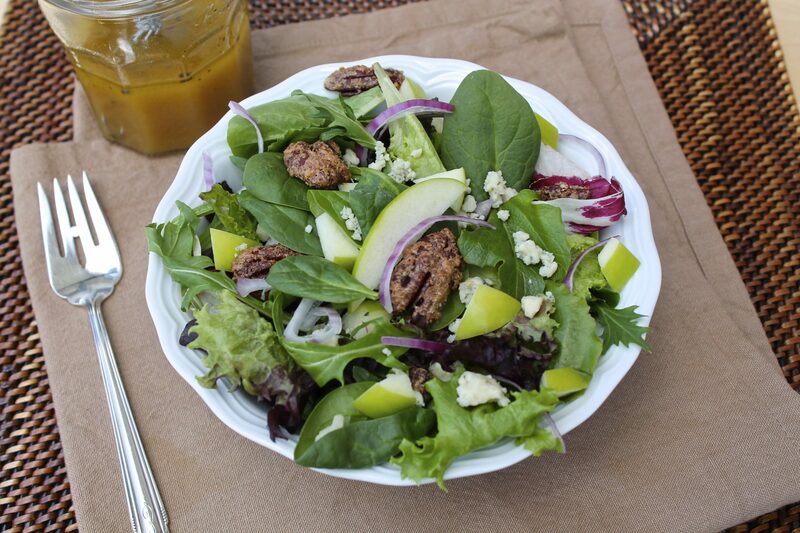 In a large salad bowl, add the greens, sliced apple, pecans, blue cheese, red onion, and dried cranberries. Drizzle with a few tablespoons of the vinaigrette just before serving and toss well. A simple trick to assemble the salad in advance but keep the apples from browning is the following: Place the sliced apples on the bottom of the salad bowl and toss with enough vinaigrette to lightly coat. Place the greens and all the remaining ingredients except the pecans on top of the apples but do not toss. Store in refrigerator, lightly covered with a damp paper towel. 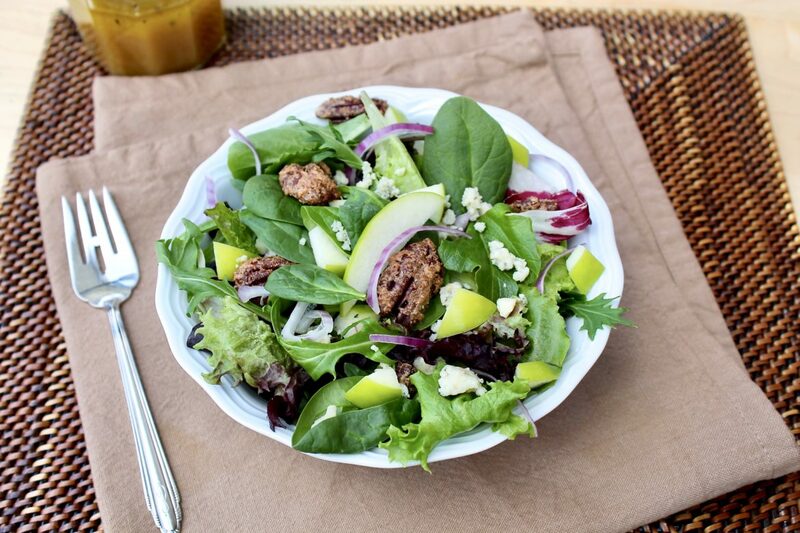 When ready to serve, toss with a little extra vinaigrette and sprinkle with the pecans. This is my kind of salad! Delish! What a beautiful and delicious salad!! Thanks for sharing on Fit and Fab! I never liked salads before but i love salads now, thanxxx….. This is one of my all-time favorites and I’m glad you like it, too! I just had this salad at a neighbor’s house last weekend and loved it. I am going to try to replicate it tomorrow for out-of-town company! I am so glad you enjoyed it, Sara! Thank you for letting me know, and enjoy your out-of-town guests! 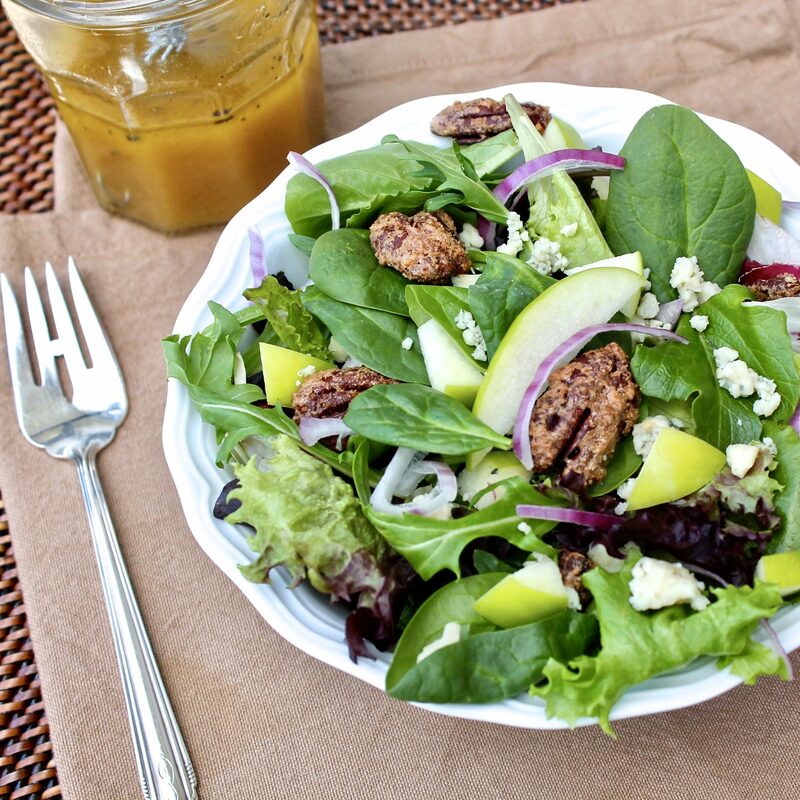 love this salad…made the pecans just to eat they are so yummy ! We love the pecans as is, too, Donna! So glad this was a hit! YUMMMM!! I think I will make this tonight Ann, I have all of the ingredients. i even think I will make the spiced pecans, something I have wanted to do for a while..
My pleasure, Mary Lou. I hope you like! I’m ready for more of the spiced pecans, too. Just finished a batch the other day! That’s awesome, Mary Lou. Thanks for letting me know!